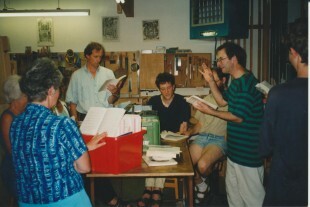 For a long time a small choir called the Welbeck Singers sang weekly in our workshop, and performed three or four times a year, usually early music, sometimes church or cathedral services. Here (clockwise) are Liz New, Phyllis Palmer, Doreen Carruthers, Dominic Gwynn, Marcus Stahl, Martin Goetze eagerly awaiting the downbeat from Edward Bennett. With her back to us is Lucy Gwynn, and next to her (out of sight) are Terry Drury and Ulrich Suschke. We are singing from the Oxford Book of Tudor Anthems, perhaps winding down from the annual madrigal concert, or preparing for a choral evensong on August 28th 1997.